Air Fryer Doughnuts are a fun, easy, healthier to enjoy everyone’s favorite treat! These Air fryer Doughnuts only take about 5 minutes to cook in the air fryer. Are Air Fried Foods Healthier For Your Family? When my kids were little, their favorite thing to do at the grocery store was pick out their favorite looking doughnut for that trip! Of course, most of time, it was the frosted ones with the pretty sprinkles. So for this Valentine’s Day, I thought I would treat my guys to these tasty, healthier doughnuts in the air fryer! I made a few batches, some with the frosting and sprinkles, to commemorate the day! Of course, I had to do a chocolate batch for them too. They are both choc-o-holics! I have been wanting to try a baked good in the air fryer. 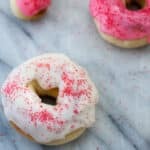 This Air Fryer Doughnut recipe did not disappoint! The Doughnuts turn out a bit less sweet and a lot less greasy than Dunkin’ Donuts’ versions of doughnuts, but super tasty, nonetheless! I did several batches of these delicious Air Fryer Doughnuts! They turned out delicious! Believe it, or not, the general concensus was that everyone who has tried them prefers the plain to the chocolate. Luckily I did the chocolate first, so they had nothing to compare them to. The recipe is identical, just add cocoa powder, if you would like chocolate doughnuts! The inspiration and recipe for these lighter for you doughnuts comes from Cooking Light, one of my favorite magazines! I love learning about different cooking techniques that can improve my family’s overall health! These doughnuts only contain 4 grams of fat! They still have the carbs, but you have splurge a bit for the holidays, right? Measure water. Heat to between 105-115°F. Add yeast and sugar. Microwave for 30 seconds, or so to melt butter. After resting 5 minutes, you will notice the yeast “blooming”, bubbling. Add yeast, milk (make sure temperature is 105-115°F), and eggs to dry ingredients. Run in mixer, with bread hook, or mix by hand and knead for a few minutes, until dough is smooth. Place in greased bowl. Cover with kitchen towel, and set in warm place. Let rise 1 hour until doubled. Roll out to 1/4″ thick, on lightly greased board. Cut out with 3″ cutter. Then cut hole out of center with 1″ cookie cutter. Cover. Let rise until doubled, 30 minutes, or so. Place in air fryer basket. Doughnuts shouldn’t touch. Air fry for 4 to 5 minutes, at 350°F. Internal temperature of doughnut should be 200°F. Cool on rack. Dip in powdered sugar glaze, or frost with buttercream frosting. So whether your Valentine is a chocolate lover, or not, (honestly, who is not a chocolate lover?  ) make them these delicious doughnuts! Thanks for stopping by to check out this Air Fryer Doughnut recipe! Happy Valentine’s Day, one and all! Bloom yeast. Heat water to 100-115°F. Add 1/2 teaspoon sugar and yeast. Let rest 5 minutes. Meanwhile, measure dry ingredients into mixer bowl. Melt butter in milk, in the microwave for 30 seconds. Stir and continue 10 second bursts in microwave, until melted. ***Be sure to let it cool to between 100-115°F, before using. Cover and let rise for about an hour until doubled. Lightly flour board. Gently roll out dough to 1/4" thickness. Cut out doughnuts with 3" cookie cutter. Cut out doughnut hole with 1" cookie cutter. Cover doughnuts with plastic wrap and then kitchen towel. Let rest on board 30 minutes, until about doubled. Air fry at 300°F for about 5 minutes. Internal temperature should read 200°F. Let cool on cooling rack. Mix sugar and water well, until no lumps of sugar remain. Dunk cooled doughnuts in glaze. Beat butter until fluffy. Gradually add 2 cups of powdered sugar, beating well between additions. Add milk and vanilla. Slowly incorporate the rest of the powdered sugar. Thin with a few drops of milk, if needed. Frost doughnuts. Freeze any unused portions for another use. These are so fun! I just got an air fryer for Christmas and have been researching recipes! I can’t wait to try these! I have all of the ingredients! Oh, great Joanne! Let me know how your family likes them! We really enjoy them! Wow what beautiful donuts! I love the pink icing too as they definitely fit the Valentines Day theme!! I can also see how they would be less greasy. Yum! Thank you Adrianne! They are not at all greasy! Light and crispy! Well, you’ve inspired me to buy an air fryer. These donuts just sounded too delicious. Can’t wait to make them! I am really enjoying mine! Thank you Emily! I hope you like it too! The Cuisinart I bought is awesome because it is multi function! Thank you Pina! We really loved them! Have a great weekend! Awesome, one more recipe to send to my mum 🙂 I’m sure she will be especially happy about this one! Oh, great! I hope she will enjoy them!! Thank you Claudia! I love Cooking Light recipes! I don’t have an air fryer, but I will try these in the oven. They sound delicious! I have never made donuts in the oven, Pam! Thanks so much for your comment! You had me at donuts! These look so tasty! Thanks Caitlyn! I appreciate you stopping by! I really love mine, Ramona! It is like a new adventure, learning how to cook with it! Yes. Fact. Time is everything! 🙂 You will love the air fryer Lesli! Let me know how you like the doughnuts! Love donuts but hate the greasiness so these sound perfect! I have an airfryer so these are on my list of treats when the family come. I agree. They are sooo greasy! I think you will like these, Amanda! Let me know! And thanks!! I’ve not yet been tempted into getting an air fryer (not enough space for another gadget!) but these look great and love that they are healthier. Cute decoration too! That is the difficult part. My Air fryer is quite large, so I had to rearrange my counters! I just love it, though! Thanks for checking them out, Caroline! These donuts look so pretty and easy to make Beth, I haven’t got a air fryer yet but still want to try, balancing between plain or chocolate first, well I’ll decide in the spurr of the moment! Thank you Patty! We liked them both but the plain were our favorite! Hello Tonia! I’m glad you found me! I have a lot more air fryer coming up soon! I hope you enjoyed the pork loin! We all agreed that we like the chocolate doughnuts, bu the plain ones are even better! (Even my chocoholic son!) Thanks for stopping by!